Now the MU is rolling along, and the third installment of the Iron Man movies seems like an unnecessary money grab. The events of the Universe had already outpaced the events of Tony’s personal story, so nothing was left to be said, but someone decided to say more anyway. The team got a new director, Shane Black, while Jon Favreau was relegated to Happy duty. Other than Kiss Kiss Bang Bang, which also stars Robert Downey Jr, Black had never directed before, so putting the final chapter to the trilogy in his hands was a bold, and probably stupid, move. I guess something had to be done; Iron Man 2 was seen as a flop, especially compared to how well Iron Man had done, so Favreau was removed from the project. But the change didn’t improve anything; this last peek into Tony’s world is the worst yet, an action-packed mess that is more in keeping with the way things used to be done than it is with the current trajectory of the MU. The Avengers have now emerged, Tony helping out, but he’s still technically a free agent. He is now with Pepper, but spends too many nights tinkering with Iron Man suits, not sleeping for fear of the dreams that haunt his nights. He now has someone whose life means more than his own, which is a new feeling, and not something he knows how to process. When a new threat called the Mandarin emerges and targets Tony, Iron Man will have to fight once more, but not everything is as it appears to be. Past mistakes will come back to bite Tony, past opportunities for kindness that he missed in his ego-maniacal youth, leading to enemies growing over the years in the shadows. Tony will have to harness the power of all his suits, and the power of his friendships, if he is to survive yet another fight for survival. This movie was unneeded; that’s probably my main gripe. 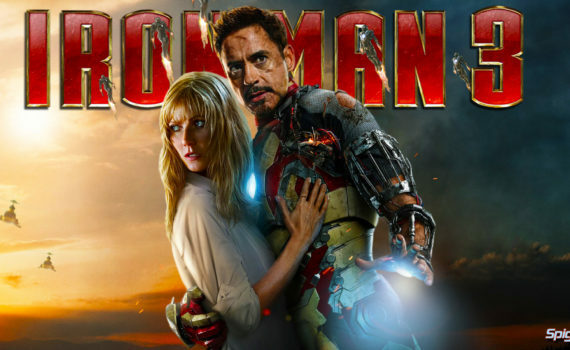 The Avengers films were taking off, we had everything we needed from Iron Man, this film is simply a grab into an empty bag hoping that there’s a little bit of magic left. We didn’t need Tony & Pepper to tell us more about the depth of their relationship, we didn’t need another super villain to emerge who’s mad at the Stark family. We didn’t need this story, and then they did it poorly, which makes the whole thing unforgivable. I can’t stand Paltrow in her role, and she gets worst every time, finally learning kung fu instantly like some robot near the end of the plot, as if her acting wasn’t unbelievable enough. The villains were all ridiculous, Rebecca Hall and Guy Pearce did not play the parts they were given very well, and the entire thing was a letdown from the very start. I’m glad they’re done making Iron Man movies; there is no more left to be said.